Riverside, CA - The University of Hawai'i men's basketball team built a 20-point halftime lead then held off a furious second-half rally by UC Riverside for a 72-63 victory Thursday night at the UCR Student Rec Center. UH improved to 10-11 overall and 4-4 in the Big West with its first road win of the year. With the win UH stayed in the thick of the Big West race, moved into a four-way tie for fourth in the conference standings. 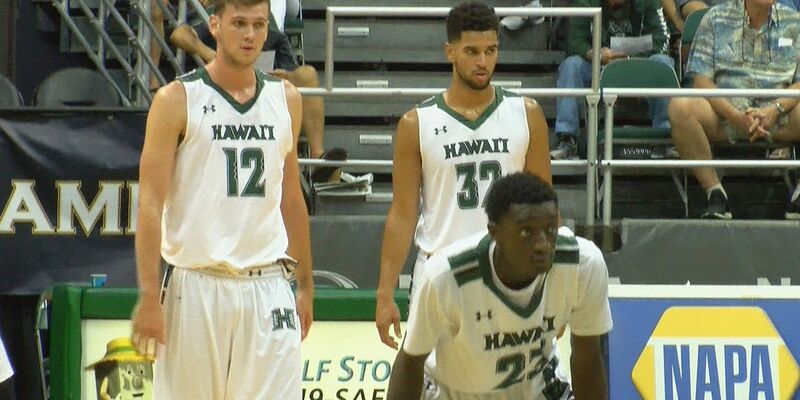 The Rainbow Warriors also avenged a painful 70-64 home loss to UCR (6-13, 4-4 BWC) just eight days earlier. A massive first-half effort keyed the win. UH held the Highlanders without a field goal for the final 9:19 of the half, part of a game-changing 25-1 run that gave UH a 38-18 lead at break. At one point UH scored 19 unanswered points during the decisive run. UH shot 56 percent from the floor, including 7-of-11 from deep, and forced 10 UCR turnovers to build its first-half lead. However, it wouldn't be an easy win. UCR came out the locker room on a 10-0 run and shot 75 percent (18-of-24) in the second half. When Dikymbe Martin buried a three-pointer, the UH lead was down to just 64-61 with 1:18 left in the game. Drammeh led UH with 15 points, along with Jack Purchase, who also added a career-high nine rebounds. Stepteau added 14 points and seven assists. UH will continue its road trip with a contest at CSUN on Saturday, Feb. 4 at the Matadome. Tipoff set for 7:30 p.m. PT/5:30 p.m. HT. The 'Bows won the first meeting between the teams, 80-77, earlier this month on Leland's Green three-pointer with less than a second left.